Many people with freshwater aquariums have thought about converting their tanks into a saltwater, even a reef, tank but have heard that it is difficult to do, that you will have to obtain all new equipment and that it will cost a lot of money. In most cases, this isn't so. If you have a functioning freshwater system you may already have most of the equipment required to make the conversion to a fantastic saltwater aquarium system. Let's quickly go through the pieces of equipment that you will need to start your new saltwater aquarium system. Obviously, if you are converting from a freshwater aquarium to a saltwater aquarium, you already have an aquarium. glass or acrylic? It doesn't really matter which, as long as it holds water without leaking. The size of the aquarium does matter, though. For the most part (there are exceptions) the larger the aquarium for a saltwater aquarium, the better. With a smaller (10 gallon or less) aquarium, when a problem comes up, things can get worse in a hurry as there is little "buffer room" for mistakes and problems, such as dangerously high ammonia during cycling, need to be fixed rapidly. One thing that many freshwater aquarists don't initially understand is that you just can't put as many saltwater fish in a certain sized tank as you can a freshwater tank. The freshwater "rule of thumb" for the number of fish in a tank is 1" of fish per gallon of tank water. The saltwater "rule of thumb" is 1" of fish for each 5 gallons of tank water. Most freshwater aquariums use gravel for the substrate. In saltwater aquariums, sand or crushed coral is used for the substrate. While gravel will work in a saltwater aquarium for a portion of the biological filter bed, sand or crushed coral works better for the various critters (i.e. sand sifting fish and invertebrates) that will occupy the reef tank. 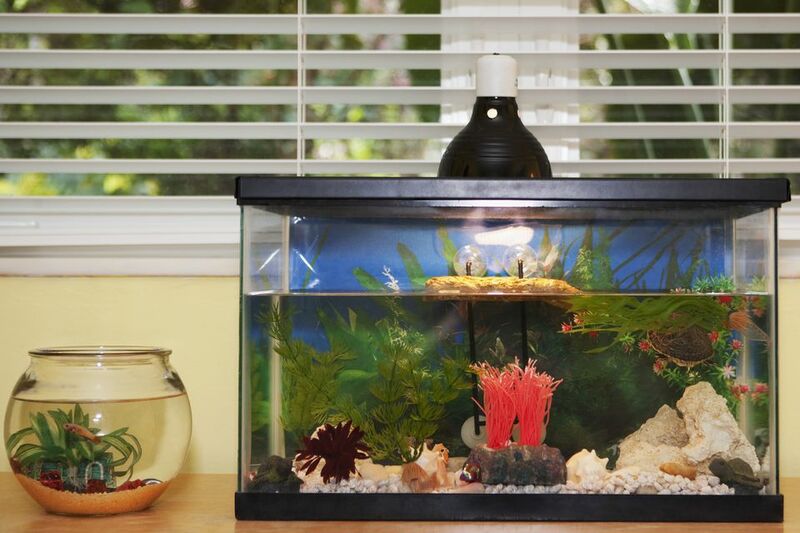 Gallon for gallon, saltwater aquariums require more filtration than freshwater aquariums. For the most part, saltwater critters need better water quality than freshwater critters. Fortunately, it isn't difficult to increase a freshwater aquarium's filtration to meet saltwater aquarium requirements. If your freshwater tank has a single hang on tank (H.O.T.) filter, just add another one to double the capacity. For the most part, H.O.T. filter only provides mechanical filtration, removing suspended food particles and other debris from the water. In saltwater aquariums, the live rock that most S.W. aquarists install in their tanks provides a majority of the biological filtration platform. Canister filters work quite well in saltwater aquariums, providing enough filtration flexibility to allow the aquarist to add or subtract different filtration options (mechanical, chemical and biological) to suit their needs. Under Gravel Filters (U.G.F. 's), which are still used in many freshwater (and even saltwater) aquarium setups are considered a thing of the past, except for certain (systems requiring low water flow) applications. U.G.F. 's require quite a bit of maintenance in order to keep them clean and free of nitrate producing tank materials such as uneaten food and detritus. Most freshwater aquarium s do not utilize powerheads or pumps to create a surge or wave effect but virtually all pumps and powerheads used in aquariums are suitable in either fresh or saltwater. The lights used on an FW tank are usually standard or NO (Normal Output) fluorescent bulbs, which will work fine for a fish-only or Fish Only With Live Rock SW tank. However, you might consider adding an actinic blue bulb alongside one of the standard tubes, or change over to 50/50's, as these type of fluorescent bulbs greatly enhance the visual look of the tank and the colors of the fishes. If you are planning to have a reef tank, you will need to upgrade your freshwater lighting to accommodate corals and some other invertebrates such as anemones which require a higher quality light in the right spectrum range. The fairly recent advent of L.E.D. lighting for aquariums has made high-quality reef tank lighting not only possible but also cost-effective (low power consumption and 50,000-hour bulb life). Other considerations are the material the light hood is made of, which may not hold up to the corrosive effects of SW, and if you want to upgrade to VHO, PC, or MH lighting, the standard aquarium hood will not hold them. If you are planning a reef system, lighting becomes much more critical and expensive. Spend some time researching your potential lighting needs before running down to your LFS and laying out a lot of your hard-earned cash. It has been our experience that the average salesperson working in an LFS doesn't have a clue to what the lighting requirements are for a reef system, which usually results in you ending up with either inadequate or unnecessary equipment. In all likelihood the heater(s) being used won't need to be replaced, just make sure this equipment is rated as safe for use in SW, particularly under-gravel cable type units that are often used in FW plant aquariums. With the exception of large stones or rocks, most FW tank decorations are useless in SW aquariums, and some items such as plastic plants can even be dangerous to marine life. Most marine fish are "grazers" and have a tendency to nibble on everything, and it doesn't take too many eaten fragments of plastic to totally shut down a fish's digestive track. As far as items like castles, bubbling divers, and sunken chests, if you are a "true" saltwater naturalist, adding these types of things are unheard of. Appropriate types of decorative rocks and corals either non-living or synthetic are generally used for decorating SW tanks, if you are not planning on adding live rock and/or keeping a coral reef system. All in all, conversion from a freshwater to a saltwater tank isn't all that complicated. Additional items such as sea salt, a hydrometer, saltwater aquarium books, and a few other supplies will need to be purchased, but by being able to use "some" of the equipment you already have, you're off to a pretty good start.